Hip Arthroscopy – Patient Information. This information is to explain what will happen when you come to the hospital for your operation. I want you to understand what to expect and feel able to take an active role in your treatment. Many different health professionals will be involved in your care during your stay and there will be a clear plan for any after care when you are discharged from hospital. Hip arthroscopy is performed under a general anaesthetic (you are asleep). I use small incisions, a camera and special small instruments. Using traction (a pulling force) to bring the hip slightly out of joint, I get a good view of the hip and any areas that are causing your symptoms. I am then able to carry out the necessary procedures. You will be positioned on a special traction table with a padded post pressing against the inside of the thigh (very close to the groin) – this is used to keep the legs in correct position. Traction is applied to each leg to allow space for the camera to pass into the hip joint. An X-ray is used to confirm that the joint is stretched opened enough to allow the camera to pass before starting the operation. X-ray is also used during the operation to help carry out certain procedures. An arthroscopy is much less invasive than previous forms of hip surgery. This means that you have a shorter hospital stay and quicker healing than more traditional surgery. You will also be able to start your rehabilitation earlier. The hip arthroscopy also aims to remove or reduce your symptoms, including pain, instability and stiffness. Your operation can take from 1.5 to 3 hours, depending on how much work needs to be performed. You may need to stay in hospital overnight following your procedure. In some cases you may be able to go home on the same day (dependent on the extent of your surgery, and the time the procedure is completed). This may vary depending on your medical history and also on how you are managing to mobilise with help from the physiotherapists. - Femoroacetabular impingement (FAI): This condition involves the head of the thigh bone (femur) and the rim of the socket (acetabulum). It is caused by bumps on the femoral head causing abnormal contact with the socket, which can lead to damage of the cartilage (labrum). This in turn can cause pain. An arthroscopy can be used to reshape the femoral head and socket to prevent this abnormal contact. 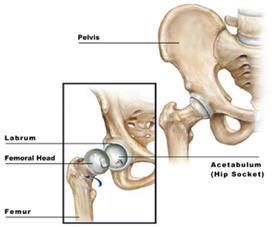 - Labral tear: The hip socket has a rim of fibrous cartilage called the labrum. It’s the gristle! This can be damaged either through abnormal contact or other causes. Common symptoms of a labral tear include a locking or catching sensation in the hip as well as groin pain. - Loose bodies: These are pieces of cartilage that form within the joint. They look like small marbles floating around in the joint space. They can be caused as a result of trauma, sports injury or wear and tear. - Articular cartilage injury: Articular cartilage covers the joint surfaces of the head of the femur and inside the socket, allowing for smooth movement. Tears in this cartilage can happen from activities such as running or jumping or as a result of wear and tear. You will need to rest until the effects of the anaesthetic have resolved. This may take several hours. Pain – You may feel some pain in your hip as well as other areas such as your lower back, buttock or knee. It is important you take your prescribed pain relief in order to help with this pain. You may also notice some swelling around the hip and groin. This is normal and should go down over the first few days. You may find that after the operation you have some pain at the front of your hip, near where the scars are. This area and the area around your hip bone may also feel tender to the touch. This can be due to inflammation of one of the tendons around the hip. Unless there are any contra-indications we would recommend regular anti-inflammatory tablet usage for the first four weeks after surgery to help with this. Using an ice pack over the area may also help. Your Physiotherapist should also be able to recommend some stretches for this area. Walking – You may need to stay overnight following your hip arthroscopy. You will be seen by a physiotherapist following your surgery and they will teach you some initial exercises as well as help you to learn to walk with the use of crutches. How much weight you are allowed to put through your operated leg depends on the surgeon’s instruction. If your weight bearing is restricted, this can be for up to for 6 weeks but depends on the procedure performed. If you have stairs at home your physiotherapist will show you how to manage these safely. Wound care – It is normal for the wound sites to sometimes leak a little bit of blood or fluid in the first few days after your surgery. The nursing staff will discuss taking care of your wound with you. You will need to see a nurse at your doctor’s surgery to have the stitches taken out at about 10-14 days after your surgery. Driving – You can drive once you are fully weight bearing and it is comfortable to do so. You must be able to perform an emergency stop without hesitation. Check the terms of your motor insurance policy to ensure it is valid, as some policies state you must not drive for a certain period of time following an operation. Work –You may return to work when the pain has settled and you are confident that you can manage. If your job is not physically demanding, this can be after 1-2 weeks. However, if you have a physically demanding job this can be longer, taking up to 8-12 weeks. An initial sick certificate can be provided by the ward – please ask the nurse before you leave the ward. Subsequent certificates will need to be obtained from your GP. Sports – Return to sports will depend on what you have had done during your hip arthroscopy. You will need to stop doing sports until you are fully weight bearing. Even at this point you should avoid any impact sports or swimming breast stroke. It can take up to 3-6 months before you are able to return to competitive sports. It is important you follow the advice from your surgeon and physiotherapist. Rehabilitation – This usually begins within 1-2 weeks of your hip arthroscopy. A physiotherapist will assess you and provide you with some exercises. Depending on the assessment findings your physiotherapist may refer you for hydrotherapy (pool) treatment. However, not every patient requires this. It is very important that you do the prescribed exercises, as they will help to build the strength in and around your hip. Your physiotherapist will then continue to review you and progress your exercises as necessary. Follow up appointment – You will have an appointment to see the consultant or a member of their team at 6 weeks after your operation. Questionnaires will be sent out electronically for you to complete about how your hip is feeling after the operation. You will also be sent these to complete at 3, 6, and 12 months post operatively. All surgery carries the risk of complications and these will be explained to you before your operation. However, in general, the risk of complications from an arthroscopy is very small. - General complications following an anaesthetic such as; inability to pass urine, constipation, blood clot in the leg(s) and/or lungs. Some swelling is normal following the operation, but if you notice that either your calf or thigh has become very swollen, tender, red and / or hot then it is important that you see your GP or attend the accident and emergency department (A&E). - Non-improvement / recurrence of symptoms. There is a chance that following the arthroscopy your symptoms do not improve. This is more common if the surgeon finds you have arthritis in your hip joint. Cartilage tears can also occur again following your surgery depending on your activity levels. This is very rare following hip arthroscopy. It is important to keep your wounds clean and dry following your operation. If infection occurs it is often superficial and can usually be treated with antibiotics. In very rare circumstances, if the infection involves the joint it may need further surgical treatment. The traction applied to the legs to separate the hip joint can result in injury to nerves in the leg. This can manifest itself as numbness in the leg that usually will recover within hours of the surgery; however, occasionally slight loss of feeling over the upper and outer aspect of the thigh can persist for much longer. Occasionally some patients may experience numbness in the groin; but this is rare and almost always resolves within 24 hours. - Failure of the labrum to heal. When the labrum is repaired surgically it still then needs to go through a healing process to ensure success. If this is Impaired for whatever reason, there can be a recurrence of symptoms, which may warrant further investigation and treatment. - Development of fibrous bands (adhesions) within the joint. Over time, this can cause pain and stiffness of the joint. Rehabilitation is the main treatment to prevent/ treat this but sometimes further surgery may be required. New bone formation can occur in the soft tissues around the hip after surgery. This can lead to restricted movement and / or pain. In extreme cases further surgery may be needed. Taking anti-inflammatory medication after surgery (unless contra-indicated) will help to reduce this risk. I advise 4 weeks duration for this reason. These are very rare but there is potential for damage to blood vessels causing bleeding. You may always notice the scars from the incision sites. The colour and tenderness of any scars can be minimised by using creams such as E45 or vitamin E oil or Bio-oil. The scars do tend to fade over a period of many months. Progression of degenerative changes (wear and tear) within the joint. Hip arthroscopy is part of a spectrum of treatment options for hip problems. Sometimes degenerative changes may progress and other treatments may be necessary including injections or even a hip replacement. - Return to full sporting activity. Depending on what procedures were performed on the hip it may not be advisable to return to high impact exercise such as running, rugby etc.